The Indoor NJSIAA Meet of Champions has added Showcase events to their lineup over recent years to, well, showcase events we don't see at the Group or Sectional level but which still hold a warm place in the heart of New Jersey track and field. One of those events, the 4x800m, has found a home in the trophy cases of Hopewell Valley and Ridge for the two years of it's existence. Some more Showcase background... The NJSIAA added the 200m Showcase in the winter of 2015 after a hiatus since 2006, the 4x800m Showcase was approved in 2016, and they most recently put together a Long Jump Showcase this season for the first time in the meet's history. So far during the two year existence of the indoor 4x800m Showcase two teams have dominated the top of the podium. The Hopewell Valley boys and Ridge girls each won both years so far and for Ridge that streak is part of an even bigger package. The Ridge girls have also won the Outdoor Meet of Champions 4x800m title for four straight years. The outdoor event has only been running since 2010, if you add two years from indoors they have six out of an 11 possible 4x800m titles. Their boys squad even completed a sweep in outdoor 2017. This is almost a school tradition at this point. As is expected year to year both squads dropped some of their winning firepower to graduation last season. Those athletes including Ridge's Kaitlyn Van Baalen and Meghan Convery as well as Hopewell Valley's Michael Pavicic and Teddy Meredith. They returned Olivia Cicchetti, Morgan Lyons, Sean Dolan, and John O'Connor. 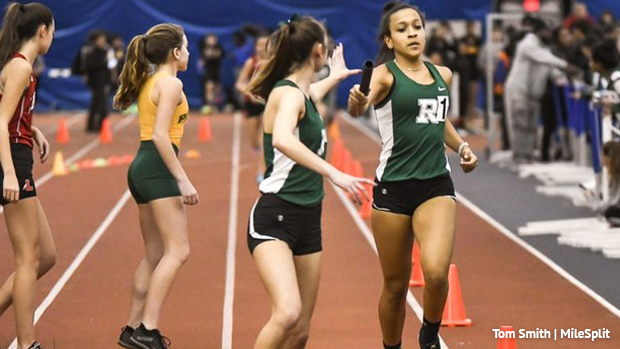 At this moment Ridge is ranked third in the State in 2019 with a 9:36.31 from their victory at Group 4 State Relays in January, you can watch that race above. That squad was made up of three juniors and one sophomore: Olivia Cicchetti, Tatum Peskin, Manon Stephen, and the sophomore Morgan Lyons. 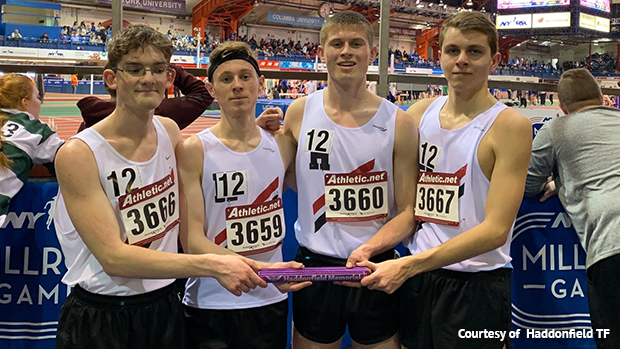 Their biggest competition so far this indoor is NJ#1 US#10 ranked Haddonfield who posted a 9:28.90 recently at the Varsity Classic and Union Catholic's NJ#2 ranked 9:35.30 which won the Non-Public A State Relay. River Dell, Rumson Fair-Haven, Red Bank Catholic, Middletown South, Ridgewood, Woodbridge, and Colts Neck are all under 9:45 as well. If we take a look at individual 800m performances added together for potential relay times Union Catholic brings that 9:35 down to 9:21, and their returning 800m runners from last indoor showed potential for a 9:15 just off the meet record of 9:14.47. Both of those reports led by junior Leena Morant who's gone 2:15 indoor and 2:10 outdoor. Pingry School also improves when looking at individual performances they move from a 9:45 down to 9:30. They aren't declared for the 4x800m as of yet, the team would include a State Champion Nicole Vanasse who will likely be attempting to defend her 3200m title just a few events beforehand or even possibly going after the 1600m earlier in the meet. All in all we're going to see times drop at the Meet of Champions and this is firing up to be a great showdown on the girl side. Is Ridge in it to keep their streak going? Of course they are, they sit NJ#3 at the moment, weren't the top seed coming in last year either but pulled out the victory, and the magical power of win streaks runs deep in New Jersey from cross country to track and field. But it is a little early to call for sure. With that said, that Union Catholic squad is no joke and has interchangeable legs if needed thanks to plenty of depth with the likes of Morant, Williams, Lufrano, Patterson, Ysaac, and more. Haddonfield is also certainly impressive with their state leading 9:28.90 this past week, splits of 2:22.4 for Sarah Naticchia 2:23.8 for Payton Weiner, 2:22.1 for Allison Colflesh and 2:20.6 for Lindsay Colflesh. That time isn't far off the seed a winning Ridge squad had heading into MOCs last year and from the same Varsity Classic meet. Onto the boys outlook, Hopewell Valley has run three 4x800m races this season their best coming during the NJSIAA Relay Championships where they finished fourth in Group 2 at 8:18.34. A team that consisted of all seniors: Alex Dumont, Sean Dolan, Will Titus, and John O'Connor. They are currently NJ#23 and aren't declared for the 4x800m Showcase as of today. So if the two time defending champions aren't returning to the fight this year let's look at who our potential new champions could be. Haddonfield made some major noise at the Varsity Classic this past week when they ran US#4 to win the meet at 7:57.56. That run consisted of a 2:02.7 for Greg Eisenhower, 1:59.6 for Ethan Spellmeyer, 2:00.4 for Martin Riddell, and a huge 1:54.8 anchor from Derek Gess. Only four teams broke eight minutes last season, hopefully we see way more this year and a few teams are certainly on the cusp. Rahway has an 8:01.18, second to Haddonfield that same night head to head. St. Peter's Prep ripped an early season 8:01.20 in December, they also ran 8:10 on a slower Bubble track in January during State Relays finishing second to Camden Catholic though neither team has declared for the event yet. The Ridge boys could be eyeing up an indoor sweep with the girls if cards fall right, they posted an 8:01.76 in the middle of January and will likely have quicker legs under them by MOCs time. Toms River North, Rancocas Valley, North Hunterdon, Pope John XXIII all under 8:10 so far this season with all of those times coming throughout the month of January. Who is likely to win? With the Meet of Champions toward the end of February and individual title seekers still to be named as well this one is too tough to call at the moment. Haddonfield's 7:57 is definitely a reason to keep eyes on them though. So many variables and too much time still to drop. Prime example, North Hunterdon had a real interesting run last year when their regular season seed of 8:17 didn't measure up to what they had to offer as a full power relay. They were stuck in the slower seeded section and won that heat with a 7:59.05 to really push Hopewell Valley when they took the track in the seeded final, Hopewell went on to run 7:57.34 for first and North Hunterdon had to settle for second overall. If you take a look at those state rankings above and wonder why the top ranked St. Benedict's Prep team isn't mentioned with their US#1 time of 7:47.60, they aren't part of the NJSIAA and won't competing in the showcase. Coaches, if you want to declare for any of the showcase events you can do so on the Meet of Champions page.